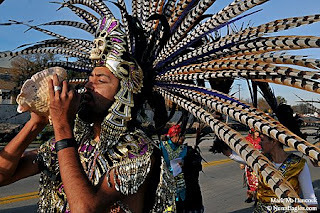 Alfonso Bustamante of Santa Clara Catholic Church in Dallas blows a conch shell at the beginning of a pilgrimage from Our Lady of Perpetual Help Parish to San Juan Diego Parish in Dallas on Saturday, Dec. 6, 2008. 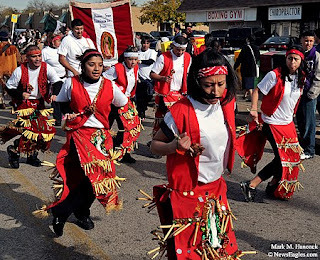 Leslie Cruz (left) dances with other members from the Immaculate Conception Catholic Church in Denton before the pilgrimage. 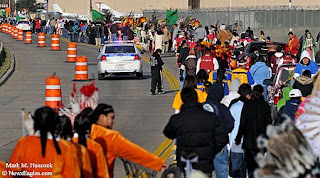 The 15th annual pilgrimage was coordinated by Pastoral Juvenil Hispana for Hispanic and Latin-American immigrants. Luis Jimenez of Saint Ann Catholic Church in Coppell prays the rosary during a pilgrimage from Our Lady of Perpetual Help Parish to San Juan Diego Parish. Member of Santa Clara Catholic Church in Dallas participate in the Marian Pilgrimage in Dallas. 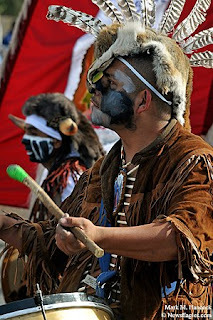 The dancing troupes are known as Matachines. 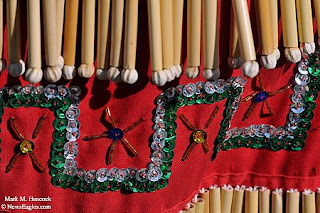 Celebrants wear ornate, hand-made costumes during the pilgrimage. 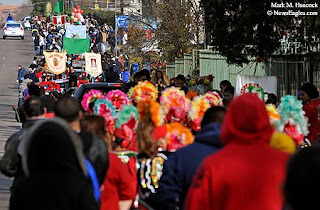 The pilgrimage is in honor of the Virgin of Guadalupe, the patron saint of the Americas. Celebrants walk past the Love Field airport during the pilgrimage in Dallas. About 1,000 faithful participated in the pilgrimage. Teresa Jordan (right) and Robert Duron (left) of Our Lady of the Pilar Catholic Church participate during the pilgrimage. 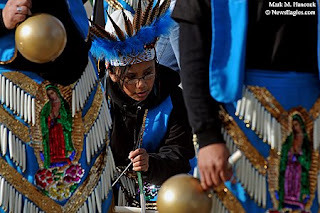 Four trucks were decorated to represent the different times the Virgin Mary appeared to St. Juan Diego. 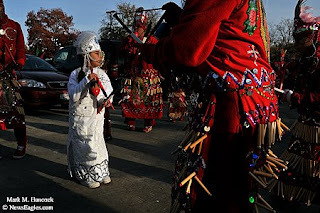 Osito Del Valle (right) of the Indio Apache Tribu (Nativos de San Miguel) drums during a pilgrimage from Our Lady of Perpetual Help Parish to San Juan Diego Parish in Dallas. Celebrants pass Crown Hill Memorial Park on Webb Chapel Road during the pilgrimage in Dallas. 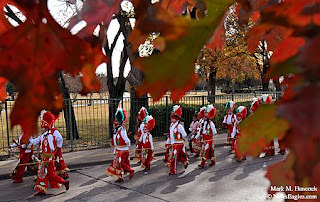 Celebrants costumes match the turning leaves as they pass Crown Hill Memorial Park during the annual pilgrimage. Yvonne Martinez (center) of Blessed Sacrament Catholic Church rests momentarily during the eight-mile-long pilgrimage from Our Lady of Perpetual Help Parish to San Juan Diego Parish. 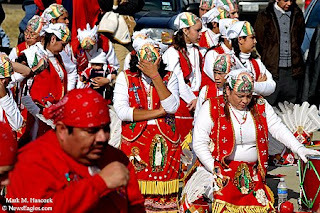 Celebrants dance on Monroe Drive in Dallas as they near the end of the pilgrimage. 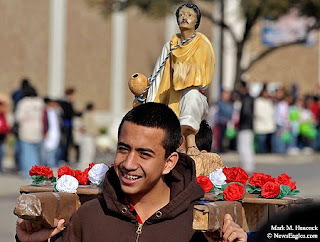 Alejandro Sanchez, 13, of Dallas carries a statue of Juan Diego during the pilgrimage. 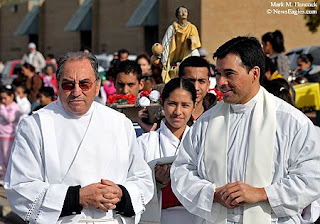 Deacon Abel Cortes (left) and Father Alberto Frausto (right) await the arrival of pilgrims near San Juan Diego Parish in Dallas. 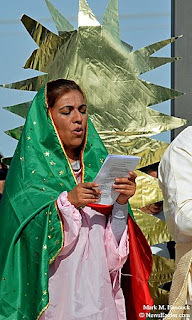 Vicky Cueto sings during an outdoor mass at San Juan Diego Parish. 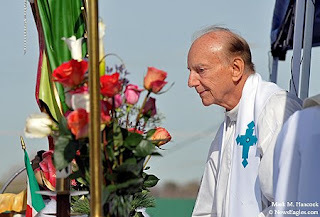 Monsignor John F. Meyers looks up after kissing the alter during an outdoor mass at San Juan Diego Parish in Dallas. 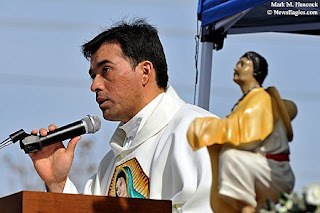 Father Alberto Frausto speaks to celebrants during an outdoor mass at San Juan Diego Parish in Dallas. 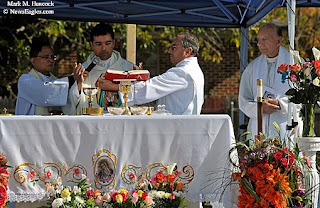 Father Alberto Frausto prepares for communion during an outdoor mass at San Juan Diego Parish in Dallas. Celebrants pray during an outdoor mass at San Juan Diego Parish in Dallas. In 1531, many native Mexicans were persecuted during the Spanish conquest. 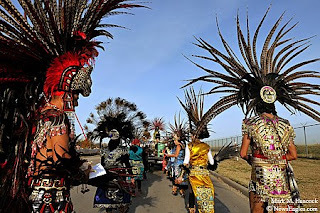 On Dec. 12, 1531, an Aztec peasant was walking near present-day Mexico City. 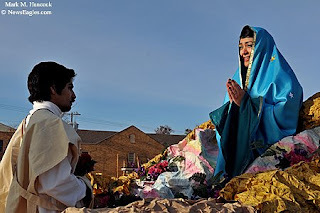 A brightly-clothed woman appeared and spoke to Juan Diego in his language. She said she was the Virgin Mary and wanted a church built on the site. Juan Diego took this information to the Spanish bishop. The bishop demanded proof. She appeared again. Although it was winter, Spanish roses appeared for Juan Diego. She instructed him to collect roses in his cloak as proof. When Diego went to the bishop, he opened his cloak and the roses fell to the ground to reveal an icon of the Virgin Mary on his apron (Tilma). The church was built by 1536, and Catholic conversion took hold across Mexico. Today, about 20 million people visit the Basilica of Our Lady of Guadalupe in Mexico City each year to see the original miraculous apron. It hangs on display behind bullet-proof glass. 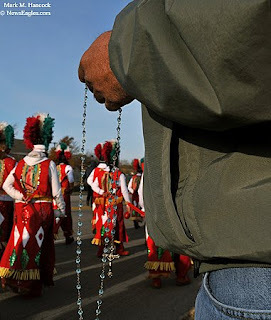 Please read, "Young Hispanics gather to strengthen Catholic identity" by María del Carmen Uceda and Jesús Gras for Texas Catholic. Please read more about the Basilica of Our Lady of Guadalupe. 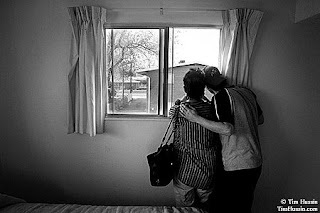 Starting Over - Hold Onto Your Family - Russ Brown looks out the window of his new bedroom with his mom, Susan Brown, at his new apartment six days after the fire. "Life is so unpredictable," he said. "Who knows what's going to happen. So hold onto your family." Please read Tim Hussin's biography, read parts A and B of this interview and see the images on his Web site. What trends do you see happening with peers at other universities? I think the evolution of multimedia. I have a good number of friends at OU and Western that I've met along the way. It seems like they're really pushing multimedia in their curriculum. We are too, but I think we're a little behind, which is one of the things I've tried to help with while I've been back at school. Universally, the main change in the curricula of photo schools is multimedia. OU and Western use to - may still have - film classes. I'm not sure if they got rid of those. I think they're weeding them out or making them electives. They're not mandatory anymore. (Darkroom classes) are being replaced more with learning video, multimedia, editing audio. Is there a push toward Renaissance Journalism? Yea, that's another thing. All these things are part of that - learning one more thing. Learning video is part of that. I think that's what made me competitive as well. You're getting all these people graduating photo schools that cannot only shoot photos, they can shoot video and audio, and some of them can maybe write well. Yea, I think the push is having us do more things at the same time, which is good to know, but at the same time I think there's the danger of spreading us thin. Taking away something from each of it. If you have to shoot video and photos in the same amount of time, that normally someone would just shoot photos, you're going to miss certain things with each media. So, I think there's a balance that you must find. Maybe it's just a matter of allowing more time to shoot video or take audio. Otherwise, people are just going to put up mediocre multimedia pieces online. I think people can tell when something is not good journalism. Even if they don't know all the technical words - or whatever words we use to describe it - they'll click on whatever else they've got on their computer screen. I think the push is into making us into Renaissance peoples. Here, design is not mandatory. We have classes here. My degree will be in journalism. I have to take a capstone course, which is a course - for example in photo - it'd be the last course you take, which is Advanced Photo 2, which is a photo story class. Along the way, you can take design. You can take HTML or Flash, which you're encouraged to do. It's a matter of if you have time for that or not. In my courses, I've taken HTML. I've taken design. I've taken reporting. A little bit of everything, but the crux of it has been photo. If you have - like me for example - I'm doing photo, and that's what I want to do. A lot of teachers are very open to me adapting projects. For example, adapting a Web page to be geared toward photography. Layout's geared toward photography. It's a pretty good program in that respect. What do you wish you had learned in college? I wish I had learned multimedia - video, editing with Final Cut. I wish I had learned multimedia, but at the same time I wish I had learned the bare-bones basics that you could get at schools like Western or OU. That'd be great if I had a film class. I feel like they have a lot of classes that really push you like you have to go to an event and just shoot one frame, and that's it. Here, I would have liked to learn multimedia and some more basic photography. But, you've got to give something up. In this case, I would give up the darkroom classes because the combination of HTML, video, photos and audio is where this is going in some respect. There will always be a place for photos and the printed page, but this is what's making people - students particularly - more marketable to any sort of publication or Web site. I don't think I have very good business skills. I just started off doing this, and it was very fun, enjoyable, and I figured out I could get paid for it. At that point, your work is good, and people are willing to pay for it, but you don't really know how much it's worth. For that reason, people tend to take advantage of you. A Business of Photojournalism class or of journalism would be invaluable to have. Yea, that would be great. Right now, I'm still trying to figure it out. People are always asking me - other people that come to forums like A Photo A Day - they're always asking, "I have this gig, what should I charge for it?" There's all sorts of things like in terms of the rights they have and how long they can use the photos and all these little pieces of that - that I have no idea about. Do you think it's important to freelance while you're in college? I think it helps. It can't hurt obviously. Trying out all that stuff in college is important: internships and freelancing, touching on all the professional pieces. What does it take to be successful in this profession? Hard work, passion, also it's important to have a vision that's unique from everybody else's - a vision that makes you stand out. It makes you different from everybody else. I see a lot of photographers that all seem to have either a style or subject matter or something that - you think of child marriage, and you think of Stephanie Sinclair. Something to make you unique is important. I will, hopefully, figure one of these things out. I think that's one of the most important things - to have a vision and to have a subject matter or approach that is unique from other people. There's so many good photographers coming into the field and are still going to be coming into the field that you need something to set you apart. What have you discovered about the profession that you did not expect? That it's such a tight-knit group of people. It's a pretty small community. There are lots of things like photo workshops, like Eddie Adams or seminars and list serves and blogs that bring all these people together. I didn't know it would be very helpful. You can feel like you're not lost in a huge, huge crowd of photographers. You feel it's somewhat manageable. You can somewhat wrap your mind around it in some way. I know there are a lot of people that don't participate in that sort of thing. There's a lot of shooters abroad that I'm not even tapped into. I feel like it's a smaller community than I expected. I always expect something new in an internship. It's been different everywhere I've gone. It's been similar, but the people have been different in different places. I expected a lot of things. I expected it to be high-paced, but still kind of laid back at the same time. I expected the standard to be pretty high, but that has evolved as I have evolved. As I've gotten better, the standard has gotten better at the places I've interned. My first internship was for credit here at The Gainesville Sun. I expected the standard to be high there. After I've gone through the rounds, I went to the Monroe Evening News, The Deseret Morning News and The Rocky Mountain News. After coming back, I can look back on that and say, "Wow. This is actually manageable." Those expectations I initially had were not quite as true as I thought them to be. Now, I can go into a newsroom and have some sort of comfort and confidence that I'm able to produce good work as well. Is it important to be technically proficient? Yea. That sort of thing stands out - especially at a newspaper. You caption and tone your photo and send it along, but there's so many tiers of people that look at it before it goes into the paper, so they're going to catch anything - any little mistake that you make. Be it in the caption or toning - if you take the blacks all the way down - they're going to notice those sorts of things. Technically, yea, that's important. That's very important. They will come out in the paper the next day if you screw up. People maybe will not trust you as much or whatever the case may be. You can't sharpen an out-of-focus photo to make it work. Having that frame the best it can be is important. You've got to have sharp photos. It's something that, at first, you aren't quite into that, but then it's something you just expect. You expect it to be exposed right, in focus. Beyond that, once you can figure out those things, you can concentrate on vision and content and the things that are really, really important - telling the story. How important is competition in the industry? It's important within the industry as far as making a name for yourself, and people seem to notice that. If you have a Pulitzer, people are going to know that. They're going to look at you a different way because of that. But, at the same time, I don't think that needs to drive people. It does drive some people, but other people stay humble, and they keep focused on the reasons they're doing it, which - I hope - aren't totally contest-driven. It differs for everybody. I think it's important to get you there probably, but I don't think it should consume people. I don't think it should consume the photographer to the point where they forget about why they’re doing this. How's the job market look for you and your peer group in general? On the surface, it looks pretty bad. At the same time, I think there are a lot of options that people might not be looking at, or might not be noticed yet. Of course, we're going through a lot of change now. People are getting laid off left and right, but for people going into the market - if you want to get a newspaper job, it might be tough. You're not going to get a job at The New York Times right away. I don't think that should discourage people, unless that's all you want to do. There are a lot of other options, be it freelance work or multimedia work. It's tough for people - like myself - coming out of school. I think they should know what's happening, but they don't need to be afraid of it. I think there's a certain excitement to how things are changing. I think that there are a lot of options that are opening up that people might not recognize yet. Multimedia is the main thing. Specifically, I don't know, it's growing a bit. A lot of people are creating these collectives. These groups of photographers that are all have a similar approach or similar message, but are all very different. I think a lot of people are banding together to deal with the issues the economy is facing. I think we will find a way out of it, or find a way to do what we want to do. Otherwise, I guess maybe we'll look for other things. But, I don't think I want to do that right away. It's important to keep an open mind and to push yourself, to keep at it. If I, at some point, run out of money, and I had to sell my cameras and live on the street, maybe I'd reconsider. But right now, it's not happening. It's important to have an open mind - a malleable mind - be open to change and be open to doing something different like shooting video. This is just a very exciting thing to be doing. It cannot only help people - teach people - but, it can also allow you to experience things that many people have never experienced, or to see things the way that other people have never seen things. It's a way to connect to people. I think being allowed into someone's life for however long it is - for a couple of minutes or a month or a year - I think that is enough to make me keep doing it. That's something that's not easily achieved. If I wasn't doing this, I don't know that I would be seeking out the life of other people. I'm able to use this like a medium to get me into places and experience things and - in turn - translate that into a form that other people can experience. I find it very exciting and somewhat noble, and I find it honorable to be that messenger - that person that does that. For people who are just getting into this, for people who want to do this, I'd say to keep doing it. 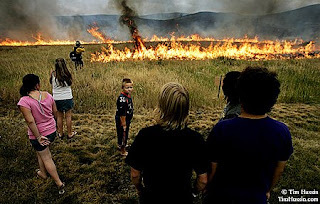 A Wildfire's Approach - Residents watch as firefighters make a fire line to stop a wildfire on Green Mountain on Monday, August 4, 2008. The fire, said to be started by lightning, approached many neighborhoods in the area causing mandatory evacuations but did not cause any property damage. Please read Tim Hussin's biography, read Part A of this interview and see the images on his Web site. Noah Rabinowitz stated, "This summer I remember Hussin talking about how much Preston Gannaway influenced him while he was interning at The Rocky. Why?" I think he talks about that more than I do. She won the Pulitzer this year for Feature Photography and was just hired on The Rocky Mountain News staff. She got there a little before I did. For me - and I think for Noah as well - she embodies that ability to be invisible. She captures these moments that are so genuine, so unique - even when she's not even spending too much time with a subject. She has this uncanny ability to do that. Those that influence me, I don't really know that they're influencing me. I just see their work and appreciate it and go on with the daily grind shooting what I need to shoot. It must influence me in some way. How it does, I'm not really sure, but I know it does. Working with her over the summer and seeing her daily work and how she produces wonderful image after wonderful image, it pushed me a lot during that summer to put my whole self into everything I shot to try to do that as well. Do you "make" or "take" photos? I like to think I "take" photos. I feel like I do my best when I capture things that are real moments that are actually happening without the presence of myself. Portraiture, illustration and things like that are not particularly my strengths. I would say I'm more of a photographer who takes photos and tries to be in the right place at the right time and tries to capture whatever that subject is by capturing unique moments that happen. Do you have a visual pet peeve? I try not to. I try to be open to a lot of things. I don't particularly like clichés. There are a lot of clichés, like a kid on a swing, for example. Things that are easy to shoot for daily work, just to get something in the paper. That bugs me a little. I know sometimes people have to do that, but more than that, I'm pretty open. I think there are some specific things - cutting off people's feet. Some of your images have body parts entering the frame. Yea. Some of them. There are some general things that you can go by. Like people say, "You have to learn the rules to break them." I'm not saying I know all the rules - I know a lot of them - but, you have to do it in a meaningful way. Sometimes it isn't meaningful. I think a lot of things are becoming cliché like that - like cutting off body parts. I think, at the same time, it can add some aesthetics to an image that make it more complete or make it more visually interesting. So, I'm open to using clichés, but at the same time I'm thoughtful when I do and the reasons that I do. Most PJ's have a driving motivation. It underlies all their projects, stories and even single images. What's yours? I might disagree. I think there are many reasons I do this. I think there probably is a overlying general motivation that I have and lots of parts to that. With photojournalism, I have the ability to make a difference and reach a lot of people. I know that's possible. It seems like it's the right thing to do. I think a lot of people - initially, before they're disenchanted with life - feel like they need to make a difference. They are happier with themselves and with their community if they feel like they're contributing something to that community. I think that's the motivation for me, is to be able to contribute something to the community that I'm in - be a part of that community and not just stand on the side and take things for what they are, but find parts of that community that I think are important, and I think are good and could tell something to somebody else and present those to people within that community and elsewhere. Just say, "Hey, this is something you need to look at and consider, maybe take to heart." I guess that's my motivation, but it's also a way for me to express myself. It's also a way for me to do something that's artistic and practical and meaningful - to not only me, but for other people. It also allows me to become a better person by experiencing more things, parts of people's lives that a lot of people wouldn't experience, unless it happened to themselves. Maybe I feel that's the best way I can express myself. If I can't do it through my own words, maybe it's through my own eyes or through the words of other people. Do you see your work as permanent? No. It's always changing. The work I have done, it's going to be there. It's going to be representative of something that happened, but it's always evolving. The daily effect you can have on people is important. You're creating this historical record, but you're also showing people something about that daily. You're showing them a viewpoint on that. Do you want to influence behaviors of others? No. That can be a result of what we do, but it's more about showing people a perspective that they might not have seen, or might make them wonder about what's important to them or what other people are going through. What drives me? Maybe it's the thought that I can connect people to stuff that can bring their own lives into perspective. What advice do you have for young photojournalists? Right now - in this current time in photojournalism, because the market is very saturated with very talented, passionate photographers, who are really good at what they do - in order to do that and compete with that, you really have to make it a lifestyle more than a job. In this case, you'd have to make it more than just going to class to go out there. You have to really want to do this to compete with that market. Really get into whatever you're doing. It's important to think of it not only as a major, but as something that you will potentially do for the rest of your life. Something that - in order to do it for the rest of your life - you really need to put your whole self into it now and grow as quickly as possible. Reach out to people who you look up to. How important was your education to your career and why? It was important in getting me started. At UF we don't have a huge photo program. We only have two full-time professors and one visiting professor. So, it's a good launching pad for me to be introduced to the field. I did not know much about it before I came here. What's made me grow most is internships. The majority of my growth has been through my own initiative - applying to internships repeatedly and getting turned down tons and tons of times but finally coming up with something and taking that opportunity to really push myself to take advantage of the opportunity and then come back here and work in class to do what I want to do - not just do the bare minimum, but do something meaningful to me and also reach out to my professors and treat that like a mentor relationship more than a teacher-student relationship. The classes here are good, but there are schools like Ohio University and Western that are much bigger and better and more competitive. We don't really see it here. A lot of younger students don't see it here, but we're competing against that - we're competing with everybody in the nation. So, you really have to go the extra length to make it work. Most of what I've learned has been achieved from internships. How did you choose UF? I'm from Florida. I'm from the Tampa area. It was free. I got scholarships, and we've got Bright Futures. It pays for tuition. Well, it's not entirely free. My parents had a Florida Prepaid Plan. Basically, they were putting money gradually ever since I was very young into an account for college. Florida has a couple of programs. Basically, I was able to get school for free. So, that was - obviously - a motivating factor. My brother went here. I came here to study environmental science. Growing up, I was always interested in taking photos. On family vacations, I was always the one with the camera. In high school, my sister gave me the camera that our grandfather gave her once he passed. That was when I first explored it a bit. But, I had never taken it seriously until I got here. I started studying environmental science, and I got burned out on taking chemistry and biology and stuff I really wasn't interested in. So I thought about journalism. I took an Intro to Journalism class, and it motivated me to explore it a bit further and eventually found that I was able to combine my interest in photography with something that was more practical. So, that's how I started. It took off from there. I started shooting a bit for the school newspaper, and they hired me a little later. I just picked it up pretty quickly. It's not like I popped out of the womb wanting to be a photojournalist. It kind of came to me and happened. I feel fortunate that I was able to find something that I truly love and that I'm somewhat good at. It was my second semester in college. I took a semester of environmental science - all kinds of science classes. The next semester, I took some of those classes as well, but I also took an Intro to Journalism class. That's where the professor - his name is Dr. William McKeen - he taught that class. He's very excited and very motivated. He makes you feel you can change the world and all these ideas. I got motivated by him in that class. So I decided to take the next class, which is a writing class. Here, the photo program is part of the journalism program. It's not necessarily a four-year program. You have to take a couple of prerequisites before you can take the photo classes. One of those is a writing class. You write a story a week in lab. I was taking photos on my own and trying to shoot for the school newspaper. Eventually that took off, and I ended up falling into the journalism photo classes and doing pretty well with this. Please also see Part C of this interview. Anarchy at the DNC - Pepper Wash - Amanda Hubbard of Denver has water poured over her eyes after she was pepper-sprayed by police. Please read Tim Hussin's biography, and see the images on his Web site. John MacDonald stated, "I actually think he's a ghost. His photos come off like he is invisible to his subject matter. Eerie and scary how good he is at this stage in his career. He's a PJ prodigy in my opinion. Good to see some strong recognition this early." How do you get close to your subjects? For one, I physically get close to my subjects. I tend to shoot more wide-angle photos. I really try to develop a rapport with the people I'm around when I'm shooting. It lends itself to being able to capture the more intimate moments that would seem like the photographer is invisible. I've admired a lot of the shooters that are able to do that. Here and there I've come across them while interning at papers. I've always admired that ability to be invisible and have the ability to connect with the subjects to the point where you're able to show that intimacy to somebody else. I guess that's the main thing. Being able to develop a relationship with the subject is important so they aren't constantly aware of you. Also, allowing yourself enough time to do this is very important. If you spend enough time with a subject, eventually they'll forget you're there. That's when the pictures are made that really speak to the readers. Do you plan to spend much time with your subjects? Ideally I do. Most of my experience is with newspapers. You can't always spend a lot of time with subjects. I try to spend as much time as possible. With projects, I've been able to spend more time with one family or one person to develop that intimacy. With a lot of the assignments I've had - a lot of the singles in my portfolio - I haven't really had that much time. It's just a fleeting thing: a fire, a news assignment or whatever the case may be. In that case, I try not to make myself a huge presence in the places I go. I try to be low key. (I) take less camera gear or not being in someone's face constantly so I can blend in and capture these photos. How does this work with wide-angle lenses? You can't, but I try not to be so intrusive. I can be next to somebody, but not bother them - not let them know I'm constantly shooting their photo. Maybe it's a matter of not shooting a lot; maybe it's a matter of not trying to be so intrusive. I do tend to shoot a lot. But, I'm conscious of how somebody is responding to me and how somebody is relating to me when I'm shooting them. I can feel whether it's going well or not going well. I try to make it the best possible situation for myself by being conscious of how a person feels all the time, and how they're reacting to me. In a lot of occasions, I - obviously - don't want them to react to me. If they are reacting to me, I would step back for a second and give them time to get back into how they are reacting with their environment without me. How long were you with the Brown family? I spent about three weeks with them. I think the final frame might have been shot six days after the fire, but I spent more time with them. A couple of frames before were from after the fact. I see myself as someone who still has a lot of growing to do. Most photographers, regardless of their talent level, I think everyone can constantly grow. I am in a spot where I have been fortunate enough to have a lot of reinforcement in what I am doing. I've had that to a point where I've been motivated to keep doing it and have been reassured that there is worth in what I'm doing, which is photojournalism story-telling. I'm in a spot that's pretty exciting for me. I'm graduating in December. I'll be out on the market. It's exciting and kind of scary in the same respect because of how the market is right now. I've had three internships at newspapers. Once I graduate, I'll take a break from that. I don't think I'm going to try to find a newspaper job - staff job - right away. I want to spend some more time doing documentary work, doing freelance work for magazines and Web sites and develop my multimedia storytelling as well. I've gotten into that a lot the past couple of internships. I can really see the future in that. It does have a lot of potential and a lot of ability to advance our method of communicating stories to people. I'm open to what is offered to me. But, as of now, I plan to work on more documentary projects. Although I haven't had the ability to really get into some serious projects, I think that's what I'm interested in pursuing for the next couple of years of my life. Just see where that can take me. Have you looked at funding? I've applied for a Fulbright Grant. I suppose that is the main issue. At the same time, I don't expect to live lavishly for the next couple of years. Now is the time when I don't have a family to support or a mortgage. I feel like now is the time I should take that opportunity to really dive into it. Take the little money I do have and put that toward what I really want to do with my life. Right now, it's continuing telling stories that are meaningful to myself, and that I believe are meaningful to society. Telling stories that can connect people and can take people out of their comfort zone and show them something they've never seen before. Both. Depending on what is offered to me, or what I can find. The Fulbright Grant, for example, I applied to one in Denmark. I'm interested in both. The main thing for me is to concentrate on one thing that is important to me now and do that. Right now, I have a lot of ideas, and I need to concentrate on something specific to do something that's powerful. I'm not sure what that is yet. What is the purpose of your work? I think the purpose of photojournalism is to connect people through sharing these stories. I think one of the things I see us doing is bringing people to a place that they've never been before and telling them something about it that's meaningful and can relate to their lives. There are lots of ways to do that. One being the Web. We don't have the barriers of having to go through the newspaper or magazine to have our work seen. The Web has a lot of possibilities - most of which people are exploring. There's newspapers. There's also things like Media Storm that are really on the forefront of that multimedia revolution. Not yet. I think that's a starting point to do a project like that - a serious documentary project with video and audio and music and put something together. Try to get it out there through the Web or even documentary filmmaking, which is another beast. I think that's something I'm interested in pursuing. I don't know where the money is going to come for that. Right now, I'm going to graduate. I tentatively have a gig at The Washington Post available to me and then the National Geographic thing, which is positive. It's what I have now. I don't know. I could graduate and go straight to doing those things, or I could have a little bit of time to work on the stuff that I've been talking about. But, I think a delivery system, sure, you could do it through newspapers, through Web sites like Media Storm, through many different nonprofits. I've got a couple of things lined up, but after that - in the bigger scheme - I'm not sure. A lot of things are changing. I could also make some connections and talk to people in the not-so-distant future, who are getting into these things. Are you considering a masters degree? No, not now. I feel like I'm done with school for now. I think that could be an option in the future. I'm ready to get out and do some work. I have a lot of friends, who are (returning for masters degrees) too. (Ohio University) masters program - I have some friends that have gone from my program - University of Florida - right into there. I know that route too. It could be an option, but I feel like I need to explore and maybe go back after I've seen the options - if that seems like a good option for me. Noah Rabinowitz asks, "Were you really drunk at the DNC?" (Laughs) Is that from Noah? I didn't have time to drink at the DNC. I was up too much. I was drunk on not sleeping. And, by the way, Noah made up that name too. Actually, we kind of came up with it together, but he's the only one that took it seriously for a second until I told him maybe we should change it to something else. We did a blog together. He was my roommate in Denver. He was interning at The Denver Post. I was at The Rocky Mountain News. That was the name of a blog we came up with and put the alternative view of the DNC up, which got this semi-cult following for a little while. Rabinowitz stated, "You are obviously pushing yourself not only as a still image maker but as a multimedia producer as well. What mixed media pieces have struck you as being especially effective recently? Why?" Some of the best work I've seen is on Media Storm. It sets the standard in some ways. I think that works. It's been what I've looked at most as something I'd like to aspire to. I've a way to go, but I don't think it's impossible. They pull together the audio, video, photos and graphics so it's seamless. I think that's something a lot of people struggle with is trying to connect these media to have them work together to tell a story. I think there are some people, who are able to do that in a way that you don't flinch when it goes from stills to video or audio all mixed together to become one. I think that's what gives it it's power. Not only the beautiful image-making - the great seeing, the great photographer, the wonderful interviews and the music - but, how it's edited and put together to work as a cohesive piece. Did you record audio separately or pull from video for the DNC piece? All the audio was taken from the video. During the DNC, I was recording - I had a video camera and was shooting stills - so I shot a lot of video. At some points, if I needed just audio, I'd take the mic out of the camera bag and hit record and just shoot photos, but have the mic recording audio. Please also see parts B and C of this interview. 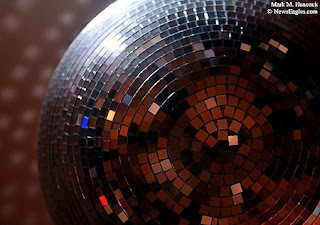 A mirrored ball reflects light during a ballroom dance session at the Plano Senior Center in Plano on Tuesday, Oct. 28, 2008. 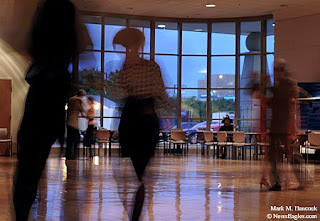 Couples warm up before a ballroom dance session at the Plano Senior Center. About 150 seniors participate in the social and fitness events. 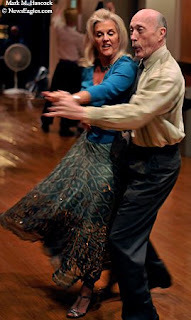 Diane Ruede (left) and Al Jensen (right) spin to a stop during a ballroom dance session at the Plano Senior Center. Janelle Moore (left) and Roland Cooper (right) show some fancy footwork during a ballroom dance session at the Plano Senior Center. 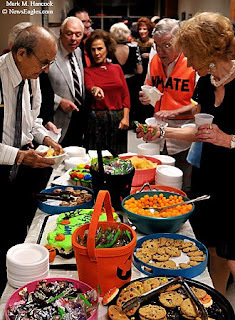 Guests take a snack break during a ballroom dance session at the Plano Senior Center in Plano. Ruby Nickens, 90, (left) dances with her partner Max Meldrum, 84, (right) during a ballroom dance session at the Plano Senior Center in Plano. 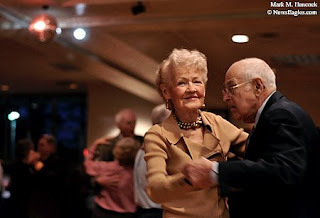 Please read, "Ballroom dancing keeps seniors active and social" by Mallary Jean Tenore / The Dallas Morning News. 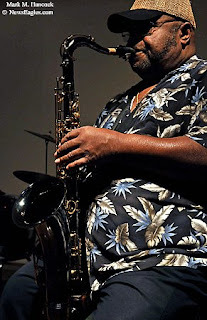 Bobby Simpson plays sax with the Doc Gibbs Band during a ballroom dance session at the Plano Senior Center in Plano on Tuesday, Oct. 28, 2008. 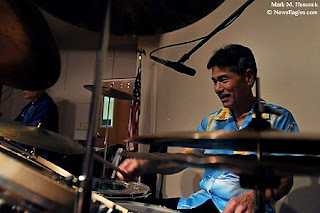 Rick Matsuda plays drums with the Doc Gibbs Band during a ballroom dance session at the Plano Senior Center. 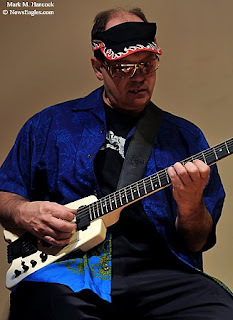 Delvin Woodard plays guitar with the Doc Gibbs Band during a ballroom dance session at the Plano Senior Center. 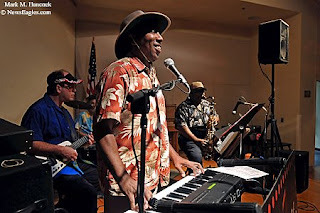 Doc Gibbs sings with the Doc Gibbs Band during a ballroom dance session at the Plano Senior Center. 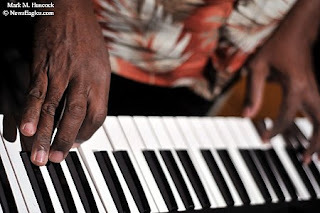 Doc Gibbs plays keyboard with the Doc Gibbs Band during a ballroom dance session at the Plano Senior Center in Plano. About 150 seniors participate in the social and fitness events. 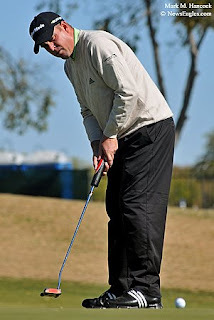 Matt Bettencourt of Greenville, S.C. putts a ball during the final round of the PGA Nationwide Tour Championship at TPC Craig Ranch Golf Course in McKinney on Sunday, Nov. 9, 2008. 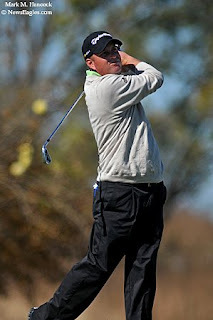 Matt Bettencourt drives a ball during the final round of the PGA Nationwide Tour Championship at TPC Craig Ranch Golf Course. Bettencourt won the tournament 68-67-63-69--267 at 17 under par. 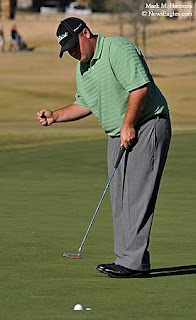 Colt Knost of Dallas (left) celebrates as a putt sinks during the final round of the PGA Nationwide Tour Championship at TPC Craig Ranch Golf Course in McKinney. Knost tied for 3rd with 67-66-71-65--269 at 15 under par. Please read, "Bettencourt beats illness to win Nationwide event." 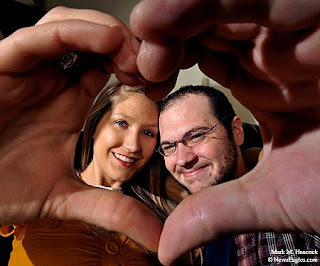 Sarah Mathews, 23, and Jonathan Bean, 24, pose for a portrait at Mathews' apartment in McKinney on Saturday, Oct. 25, 2008. The couple met on a missionary trip in Peru. They're getting married in December. Please read, "Couple met on mission trip in mountains of Peru" by Bill Marvel. Celina's Jose Romero (No. 1, center) shucks away Argyle's Scotty Siebert (No. 44, right) as John Walker (No. 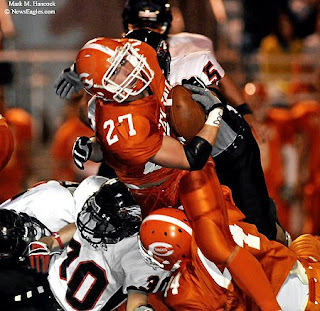 28, left) arrives during a District 9-3A high school football game in Celina on Friday, Nov. 7, 2008. Celina's Cody Sandler (No. 6, right) catches Argyle quarterback Chad Hedlund (No. 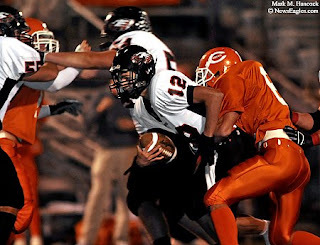 12, center) during a District 9-3A high school football game. Both teams entered the game with 3-1 district records. Celina quarterback Cody Worrell (No. 10, center) resets his mouthpiece after a snap during a District 9-3A high school football game against Argyle in Celina. 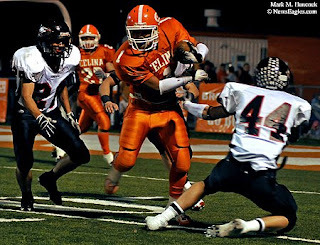 Celina's Jordan Stout (No. 78, left) blocks for Charley Waldrep (No. 22, right) during a District 9-3A high school football game against Argyle. 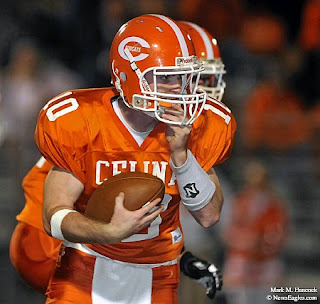 Celina quarterback Cody Worrell (No. 10, center) laterals the ball during a District 9-3A high school football game against Argyle. Celina's Troy McCartney (No. 27, center) fights for additional yards during a District 9-3A high school football game against Argyle in Celina. Celina won the game 35-13. 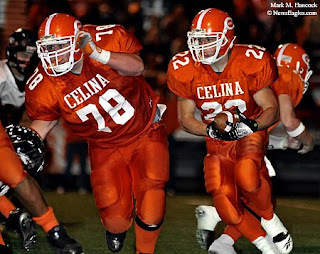 Please read, "Football: Celina runs over Eagles" by Bill Spinks. Ana Rosa Vasquez, N.D. Bioenergetica, poses for a portrait at Famisalud Natural in Farmers Branch on Tuesday, Oct. 28, 2008. 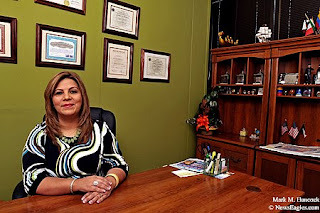 The Bolivian immigrant studied family psychology and encourages a holistic approach to women's health and self esteem. Waxahachie Legacy's goal tender Landon Swalberg (No. 5, center) punches FC D'Ville's ball away from a goal attempt during a league soccer game at the Waxahachie Soccer Complex in Waxahachie on Saturday, Oct. 11, 2008. Waxahachie Legacy's Damon Peel (No. 2, center) and FC D'Ville's Kenneth Byrd (No. 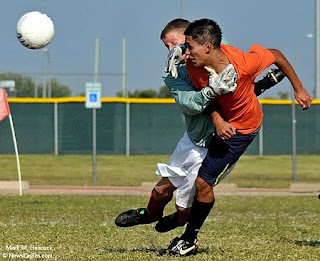 1, right) tangle feet on the ball as Damian Vega (No. 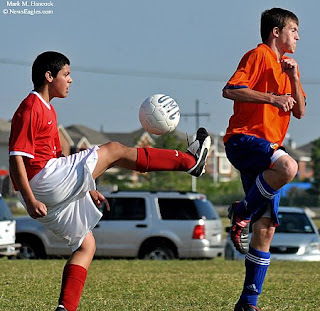 4, left) approaches during a league soccer game at the Waxahachie Soccer Complex. Waxahachie Legacy goal tender Landon Swalberg (No. 5, left) collides with FC D'Ville's Miguel Garcia (No. 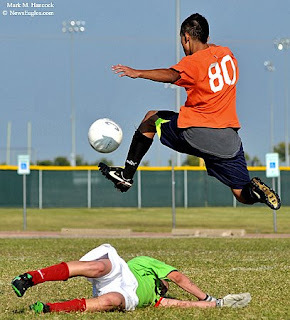 80, right) during a league soccer game at the Waxahachie Soccer Complex. FC D'Ville's Caleb Mancia (No. 99, left) kicks the ball as Waxahachie Legacy's Jesus Vazquez (No. 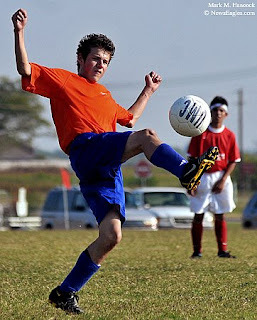 24, right) observes during a league soccer game in Waxahachie. Waxahachie Legacy's Damien Martinez (No. 4, left) kicks the ball as FC D'Ville's Jacob Hinton (No. 12, right) blocks during a league soccer game at the Waxahachie Soccer Complex. FC D'Ville's Miguel Garcia (No. 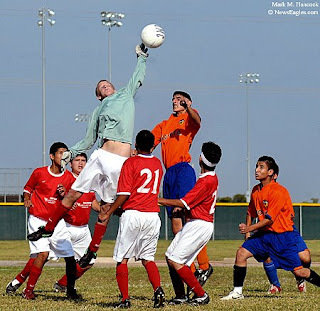 80, top) leaps over Waxahachie Legacy goal keeper Landon Swalberg (No. 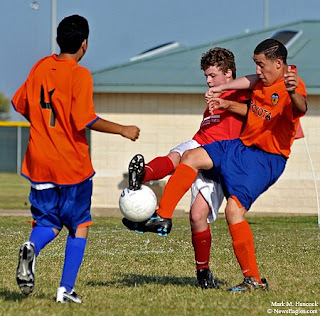 5, bottom) during a league soccer game at the Waxahachie Soccer Complex in Waxahachie. FC D'Ville won the game 4-2.